April 28th is The Day of Mourning honouring workers in Canada who were killed, injured or disabled on the job. The following bike tour visits a number of sites throughout the region that allude to the Day of Mourning. The route is entirely along bike paths. Our tour begins in Vincent Massey Park where sits a carved stone memorial chosen for it’s proximity to the Heron Road Workers Memorial Bridge, completed in 1967, a year after a previous bridge at the same site collapsed killing nine workers in the worst construction accident in Ottawa’s history. 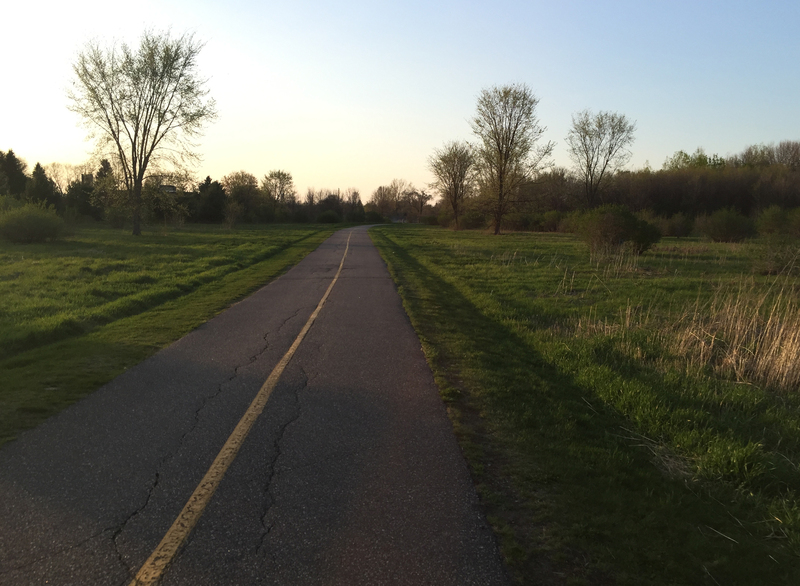 Ride along the Rideau River Eastern Pathway, then traverse Hogs Back Falls before turning onto the Rideau Canal Eastern Pathway. Cross the canal over the Hartwell Locks opposite Carleton University. Continue down along the Rideau Canal Western Pathway through the Arboretum and around Dows Lake. A short distance away from the northern edge of Dows Lake on Preston Street a construction site accident occurred on March 23, 2015 – the tragic death of Olivier Bruno who was struck by a falling chunk of ice while inspecting the construction pit. Continue along the canal as far as City Hall wher, at the north east corner of the plaza in front of City Hall, you will find the Ottawa Firefighters Memorial. This memorial includes a number of marble plaques commemorating firefighters who have perished in the line of duty, some dating back to the mid 1800’s. Head back to the Rideau Canal Pathway and continue north along the edge of the canal. Just before reaching Sappers Bridge that passes under Wellington Street, you will encounter two short sets of stairs. These have metal troughs along which you can push your bike to avoid having to carry it up the stairs. Ride under the bridge, then down the hill. The canal locks wil be to your right and Parliament Hill high up above to your left. Cross over to the other side of the canal across the second to last set of locks closest to the Ottawa River. Once on the opposite side of the canal you will notice a celtic cross. The engraving in the base of the cross reads,’In memory of 1000 workers and their families who died building this canal’. An accompanying interpretive panel helps to explain the context in which these workers found themselves and the hardships they endured. UPDATE, August 2017 – Unfortunately the cross was knocked over and has yet to be replaced. UPDATE, April 2018 – The cross has been replaced. The bike tour continues up the hill to the left of the cross. At the top of the hill, turn left onto the bike path and cross the Alexandra Bridge over the Ottawa River along the wooden boardwalk. Once arrived on the Quebec side of the bridge, cross the intersection to the opposite corner where the Sentier de l’Île pathway begins. This path heads inland along Boulevard des Allumettières. Les Allumettières were female workers in the local EB Eddy plant who fabricated wooden matches from the 1800’s up until 1928 when the plant closed. The working conditions they endured were extremely dangerous and unhealthy. An interpretive panel along the path goes into more detail on the incredible challenges Les allumettières encountered. Thus completes The Day of Mourning bike tour. For those interested in further exploring the path along Sentier de l’ile check out this ride. Many Canadians are drawn to the November 11th Remembrance Day Ceremonies held at the National War Memorial to pay tribute to those who have fought and given their lives in the service of our great country. 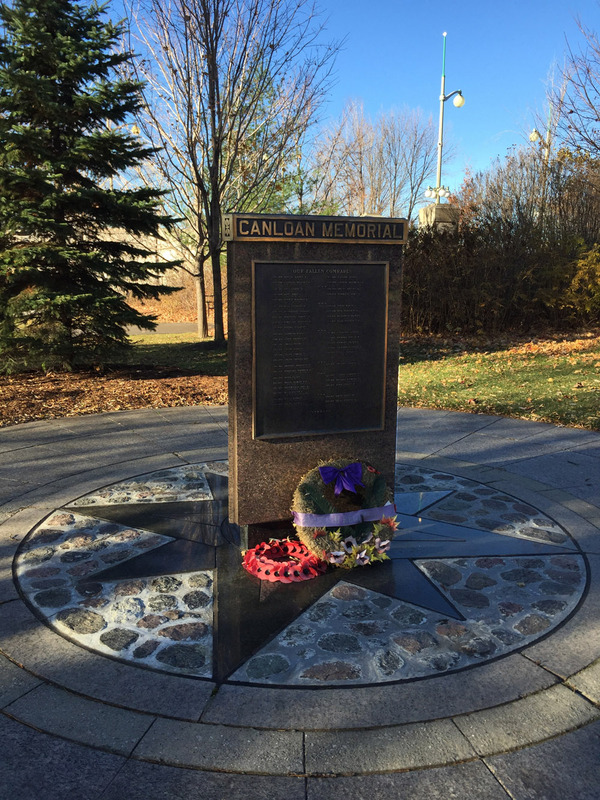 There are also a number of lesser known Canadian war memorials throughout the capital commemorating groups within the Canadian military, or specific struggles in which Canadian soldiers have served. The following bike tour visits these memorials, starting from the National War Memorial and ending at the National Military Cemetery. UPDATE -November 2017 – There is one detour from the original route, identified as the orange line on the map below. The National War Memorial was unveiled in 1939 to commemorate those who served in the armed forces during World War 1. Subsequently it has come to symbolize the sacrifice of all Canadian Armed Forces in times of war. Immediately in front of the Memorial is the Tomb of the Unknown Soldier. This tomb contains the remains of an unidentified Canadian soldier who died near Vimy Ridge during the First World War and represents the many Canadian soldiers who have no known grave. There are bronze panels on the east and west sides of the War Memorial that describe the significance of the Tomb of the Unknown Soldier and the main sculpture – The Response. Leaving the War Memorial, Head down to the Rideau Canal behind the National Arts Centre, which is presently under renovation. There are two very short flights of steps just before reaching the walkway path along the canal that have troughs to push your bike. 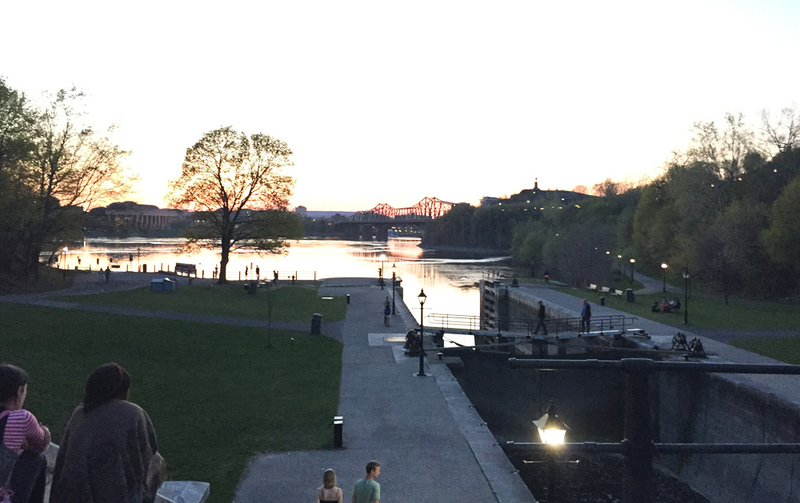 Head south along the canal for a short distance until you are past the National Arts Centre and have crossed under the Mackenzie King Bridge and turn in to Confederation Park to where the South African War Memorial is located. Continue through the park to the sidewalk along Elgin Street where one can see the National Aboriginal Veterans Monument. The tour crosses Elgin Street at Laurier Street and follows the Laurier Bike Lane heading west before turning north along the bike lane that runs along Bay Street. After crossing Wellington at the northern end of Bay, head east for one block to Lyon St. There is a gravel path through the park just to the east of the National Archives building that leads to Lyon. Looking across Wellington up Lyon Street, one sees the Veteran Memorial Buildings. Beneath the arch connection the two buildings across Lyon St there is a stone relief carved by Ivan Mestvovic in honour of those Canadians who fought in the First World War. Head west along Wellington, which has a bike lane beginning at Lyon Street. This bike lane continues across the Portage Bridge. Just before heading over the Ottawa River there is a path off to the right that leads down to the Royal Canadian Navy Monument. 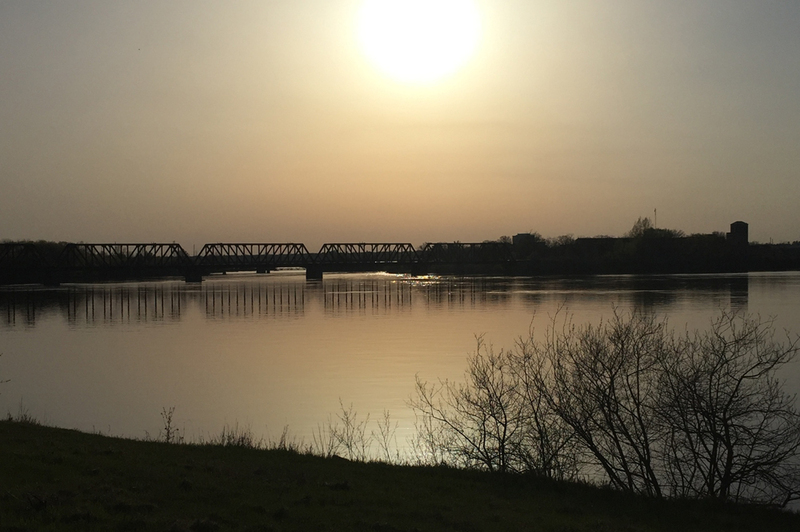 Head back up to the Portage Bridge and cross over to the Quebec side of the river, then turn east along the Voyageurs Pathway that hugs the shore of the Ottawa River. One of the finest views of Parliament Hill can be seen from this section of path. The Memorial Chamber, located inside the Peace Tower, contains the Books of Remembrance recording every Canadian killed in service from Canada’s first overseas campaign, the Nile Expedition, to the present. UPDATE, November 2017. This is the first of tthe two detours decribed in the introduction. 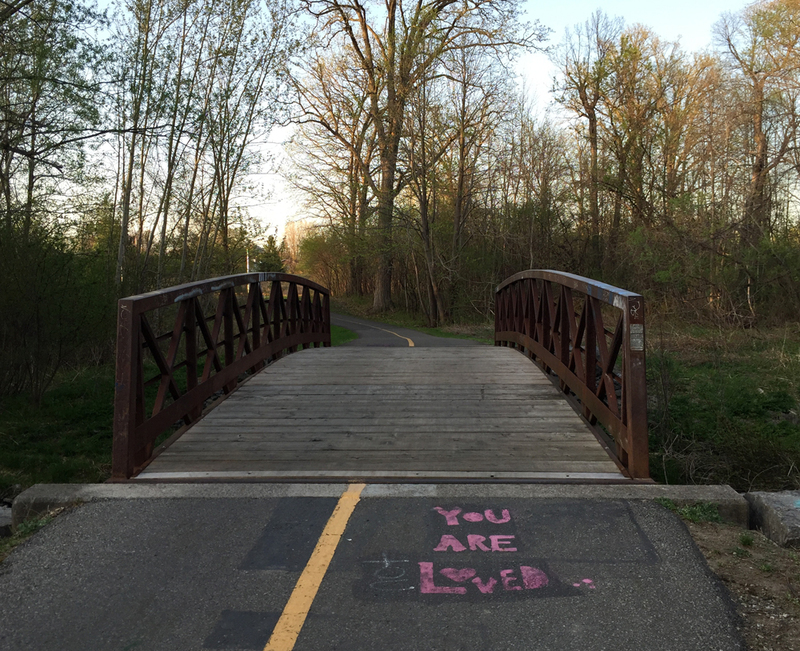 Due to flooding in the Spring of 2017, the path along the river between the Portage Bridge and the Museum of History was so badly damaged that the NCC decided to wait until next Spring to fix and replace this very symbolic stretch of pathway. As such, the detour along the wide sidewalk along rue Laurier is reccommended. Our route heads back to Ottawa over the Alexandra Bridge to our next stop, The Peacekeeping Monument, dedicated to Canadians who have served as peacekeepers around the world. It is located on a traffic island along Sussex Drive between the national Gallery and the American Embassy. You can meander through the centre of this monument. The first of the three memorial installations is dedicated to members of the Royal Regiment of Canadian Artillery who gave their lives in battle. A sculpture of Lieutenant-Colonel John McCrae, created by artist Ruth Abernethy. John McCrae was a doctor who participated in the First World War. He was moved to write the poem In Flanders Field in memory of fellow Canadian soldiers killed during the Second Battle of Ypres. It is from this poem that the red poppy was drawn to become the symbol of Remembrance Day. Across the park are the Commonwealth Air Forces Ottawa Memorial, and the Mackenzie-Papineau Battalion Memorial dedicated to Canadian volunteers of the Mackenzie–Papineau Battalion during the Spanish Civil War. The tour continues along Sussex Drive. At the southern corner of Sussex Drive and Stanley Avenue is the CANLOAN Monument, dedicated to Canadian soldiers who died while volunteering with the British army during the Second World War. Head east along Stanley Avenue and the Rideau River Eastern Pathway. Then take the short gravel path that leads to Crichton Street and weave your way along Vaughan and MacKay Streets to where the bike lane along Beechwood Avenue begins. Further along one arrives at the entrance to Beechwood Cemetery. The National Military Cemetery is located within the grounds, as indicated on the above map. the poem In Flanders Fields is cast onto a bronze plaque and mounted on a simple elegant plinth facing the rows of white tombstones. A while ago I joined a walking tour of Parliament Hill with Jaime Koebel. 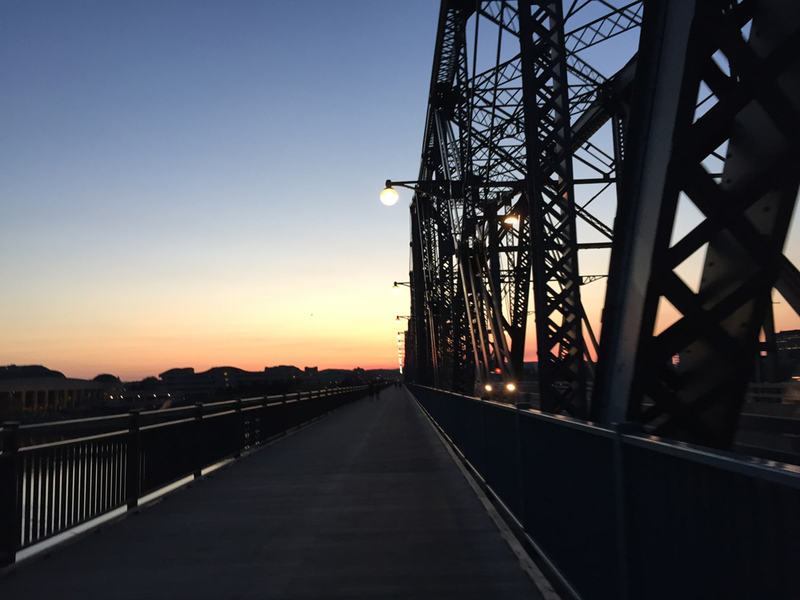 Jaime runs Indigenous Walks which she describes as, ‘A guided walk & talk through downtown Ottawa that presents participants with social, political, cultural & artistic spaces from an Indigenous perspective‘. 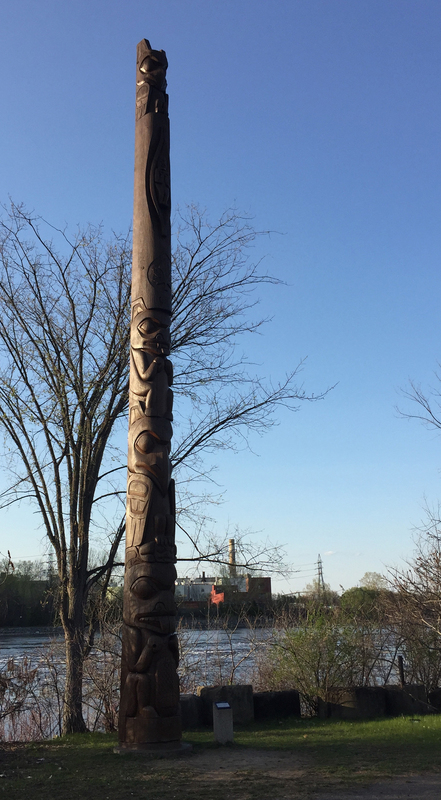 As we looked out across the Ottawa (or Kitchissippi) River towards the Museum of History, Jaime mentioned the totem poles displayed within the museum, as well as a number of others carved by indigenous sculptors located outdoors within the area. Here’s a 33km loop that visits those sites. This bike tour is almost entirely along NCC multi-use paths. UPDATE 2018: I’ve added an optional detour to Rideau Hall where stands another totem pole (see purple line on map). More on this piece further down in the post. Our ride begins near the eastern tip of Victoria Island where stands this totem pole sculpted by Walter Harris of the Gitxsan First Nation in northern British Columbia. I rode west and accessed the Ottawa River Pathway behind the War Museum, and followed it along the river to where it connects to the Pinecrest Creek Pathway. 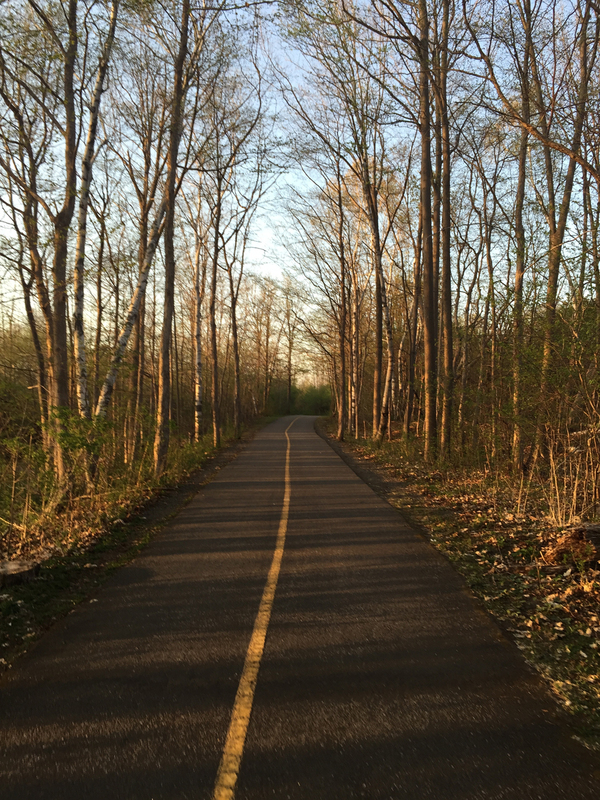 I rode the length of the Pinecrest Creek Pathway to Woodroffe Avenue. On the south side of Woodroffe the path continues as the Experimental Farm Pathway. On the south side of Maitland the path weaves it’s way up through a wooded area. 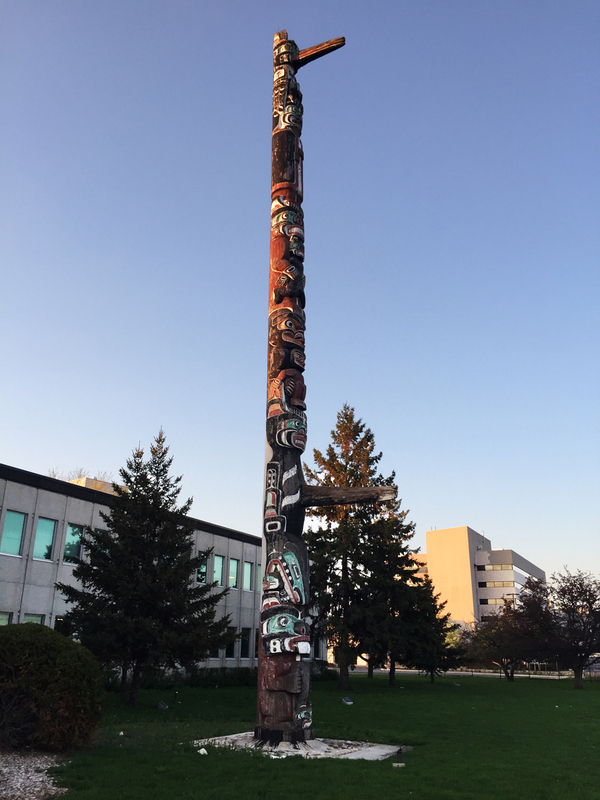 The second totem pole on our tour is located in front of the Scouts Canada National Office on Baseline Road. To get there I turned off the pathway and cut through a residential area along paths and quiet roads as shown on the above map. 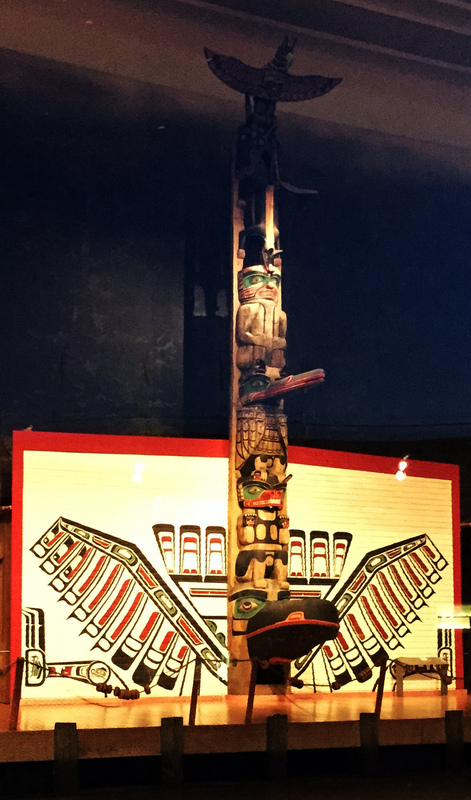 This totem was carved by Chief Mungo Martin, a Kwakwaka’wakw carver from British Columbia. It was acquired by the Boy Scouts in 1960. 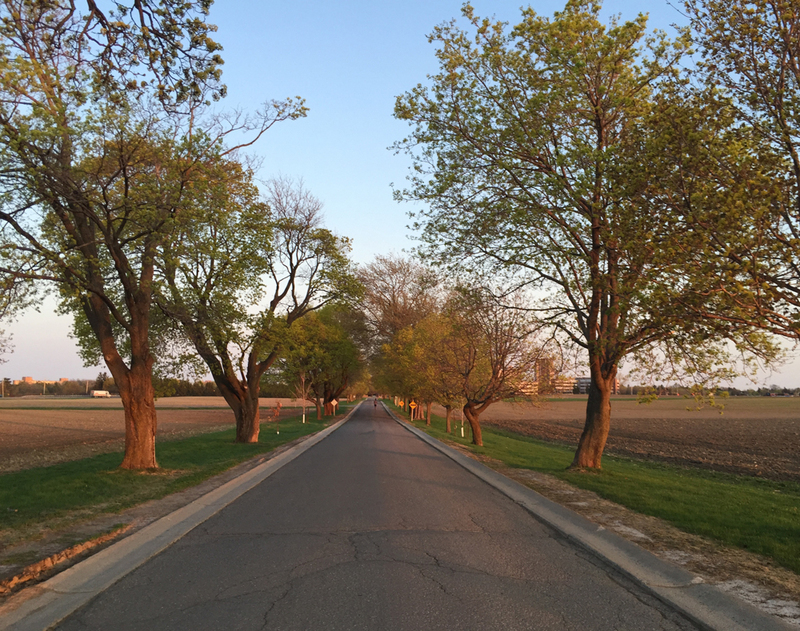 I then headed back to the Experimental Farm Pathway which runs along farmed fields east of Merivale Road. Sections of the pathway east of Fisher follow along quiet roads through the farm. I crossed Prince of Wales Drive at the signalized crosswalk and headed over to the Rideau Canal locks beside Carleton University. I crossed the locks and biked down the Rideau Canal Eastern Pathway towards downtown. 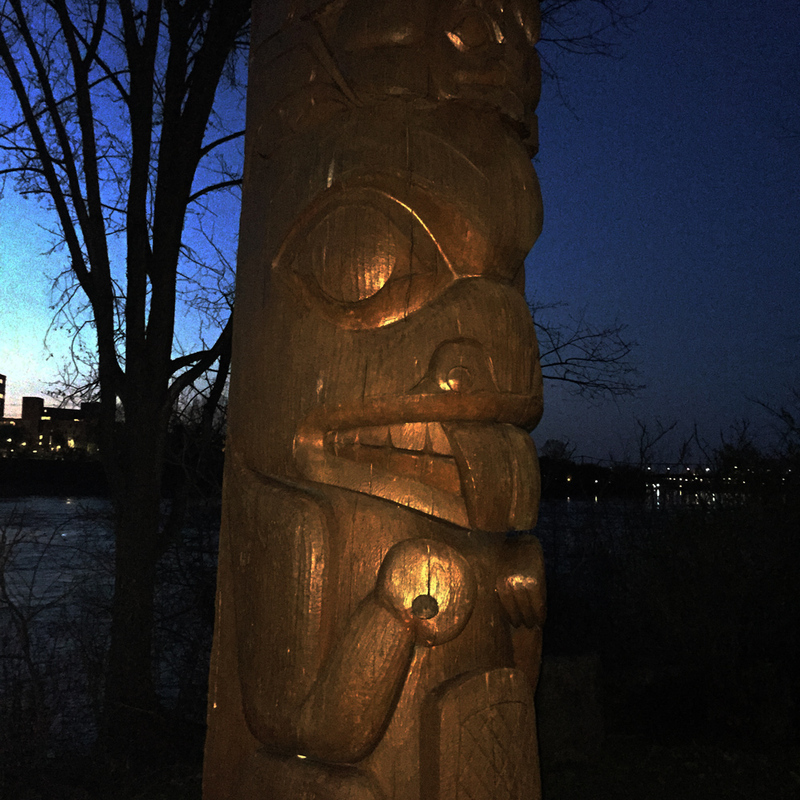 I re-traversed the canal at the Somerset pedestrian bridge and headed over to Confederation Park to visit the third totem pole along the tour, sculpted by Henry Hunt also of the Kwakwaka’wakw and apprentice of Mungo Martin. 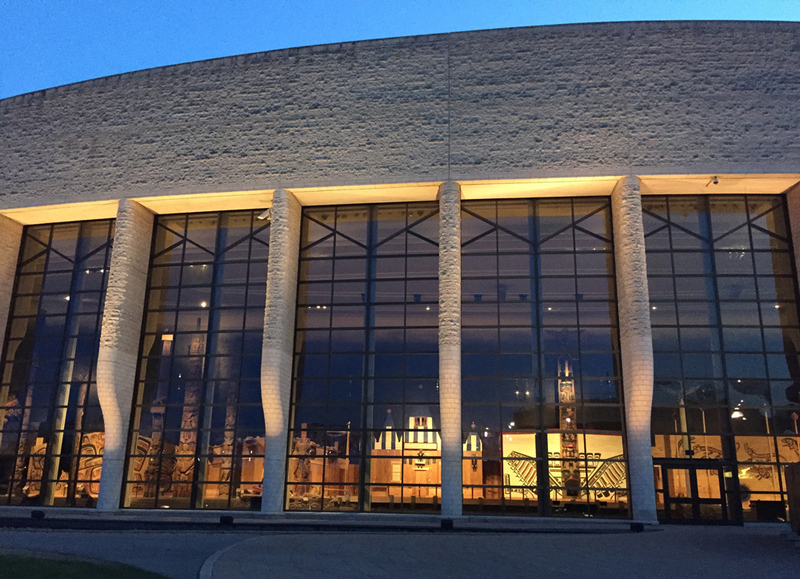 Next stop – the Grand Hall of the Museum of History. To get there I rode down beside the canal and across the second to last set of locks. I then rode up the paved path from the river and crossed the Alexandra Bridge to our final stop at the Museum of History in Gatineau. 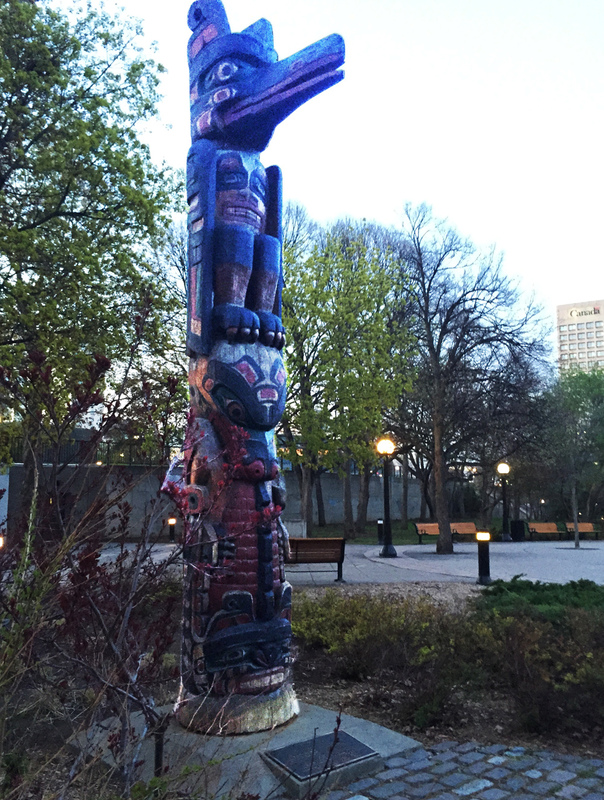 I UPDATE – August 2018: There is another totem pole sculpted by Mungo Martin located on the grounds of Rideau Hall. The purple line on the above map shows how to get there via the bike lane along Sussex Avenue , and then back, crossing the MacDonald-Cartier Bridge to the Quebec side of the river, versus the Alexandra Bridge. The grounds of Rideau Hall are open to the public up until 1 hour before sunset. The best time to visit our final spot along the shore of the Ottawa River facing the Museum of History is in the evening as the sun is setting. 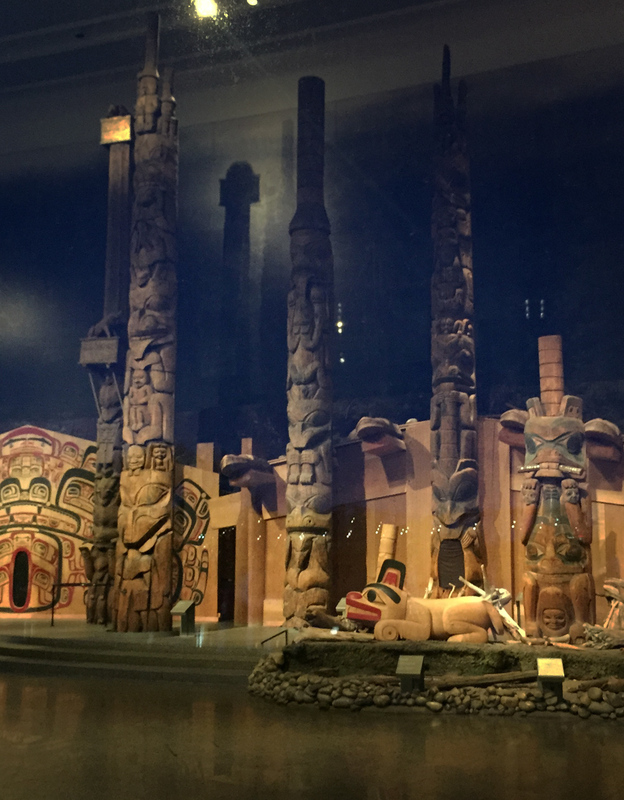 That’s when the vista of totem poles within the Grand Hall of the museum are most visible from outside the large windows. Here are views of these majestic sculptures as seen from outside as well. To complete the loop I rode along the Voyageurs Pathway beside the river, then halfway across the Portages Bridge back to Victoria Island. UPDATE 2018: The NCC has yet to complete repairs along the Voyageurs Pathway caused by the Spring flooding of 2017. The alternative route, as per the orange line on the above map, goes along the very wide Laurier Avenue sidewalk which is being used as an interim multi-use pathway. Canada is home to one of the largest populations of bears in the world. They have inspired sculptors from across the country and been depicted in many of their works. I have yet to come across a wild bear on any of my cycling exploits, as have these fortunate cyclists, however I’ve happened upon a number of sculptural interpretations of the Ursidae family throughout the capital. So, if you are a lover of bears, or sculptures of bears, this tour is for you! 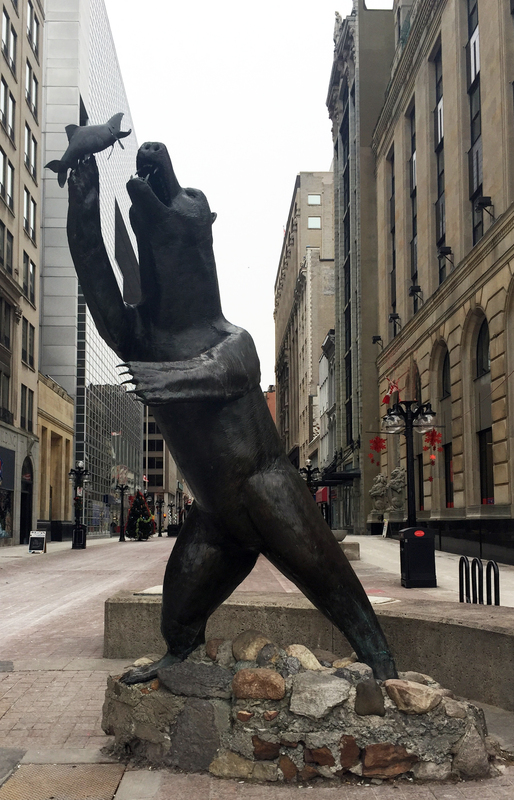 We begin at the intersection of Sparks Street and Elgin Street where stands this big bronze statue of a fishing grizzly by artist Bruce Garner (for tours of other sculptural works by Bruce throughout the capital, click here). I then rode around the National Arts Centre via the ramp off Elgin Street, and cut through Confederation Park to the National Aboriginal Veterans Monument, sculpted by Lloyd Pinay. 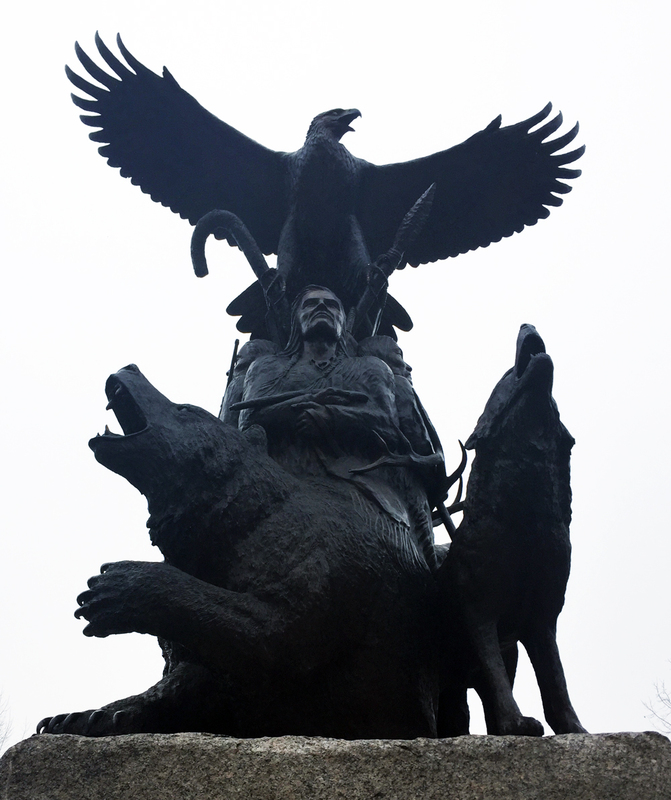 A life sized bear is one of four animals depicted in the base of the bronze sculpture, each representing spirit guides. The bear symbolizes healing powers. Our next stop is located in the Jeanne d’Arc Courtyard in the Byward Market. To get there I cut through the plaza in front of City Hall, then along quiet residential streets to the bike & pedestrian bridge over the canal at Somerset St. 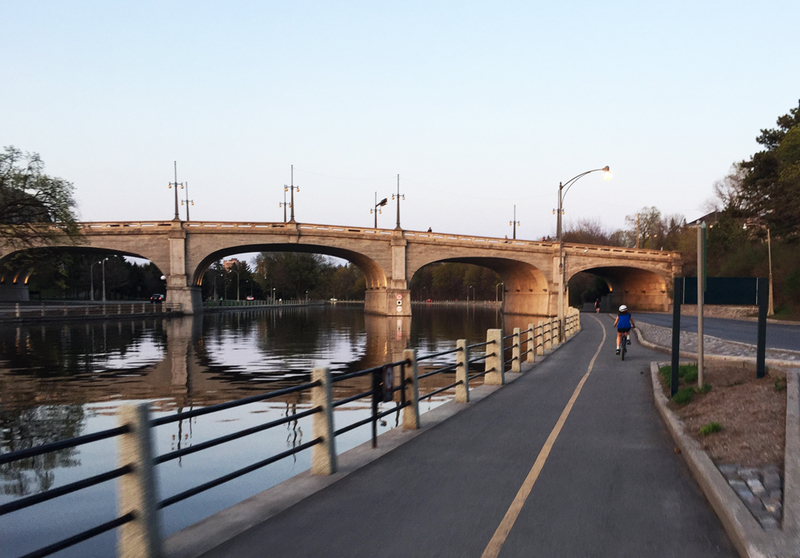 I then rode along the Rideau Canal, and crossed Colonel By Drive at Daly Avenue. The stretch of Colonel By/Sussex St between Daly and George where it intersects Rideau Street does not have a bike lane and most times of the week it is filled with cars, trucks and buses jostling their way through this busy intersection. The safest time to try this tour would be early Sunday morning when biking through this area isn’t so dangerous. To access Jeanne d’Arc Courtyard from the south requires walking along the York Street sidewalk just off Sussex for a short distance. 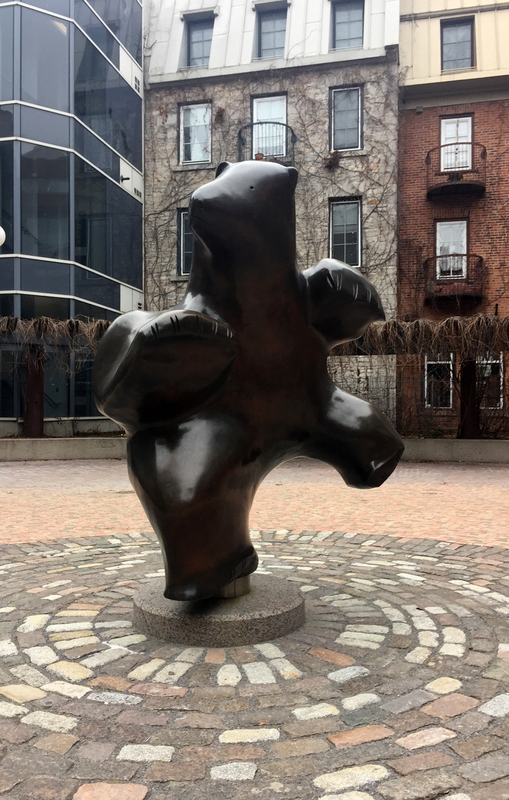 Within the courtyard you’ll find Dancing Bear by Inuit sculptor Pauta Salia. Our last destination is Green Island located in the middle of the Rideau River. To get there I made my way from the Jeanne d’Arc Courtyard over to St Andrew Street which crosses busy King Edward at a signalled crosswalk. I then took Rose Street to the path through Bordeleau Park. The path through the park pops out onto Union Street and over the white bridge onto Green Island. 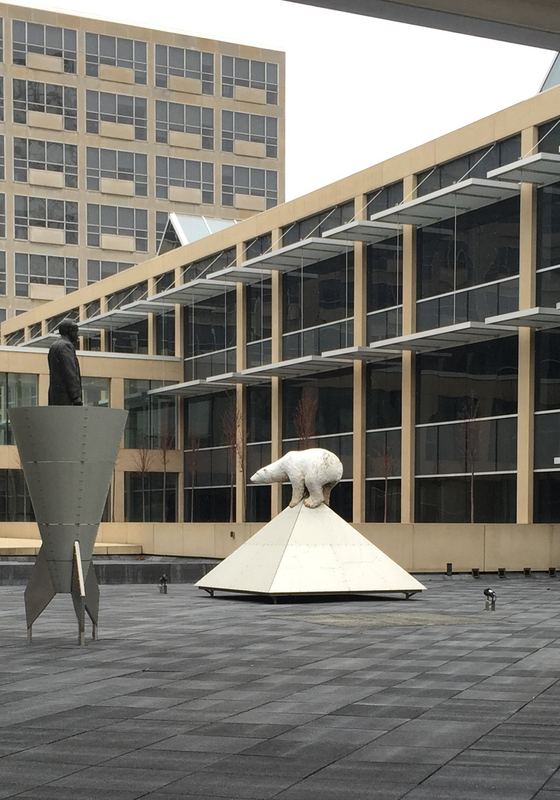 The Old City Hall covers most of Green Island, and in the central open space sits this sculpture of a polar bear perched on a metal pyramid engraved with star constellations. It is one of a grouping of three sculptures by Catherine Widgery titled Objective Memory. The pieces are surrounded by water in the summer months. As I was riding home snowflakes started to fall signalling the arrival of our most recent storm. Unless we experience another freak thaw such as the one we just had between Christmas and New Year’s, this tour may have to wait until Spring. No worries, lots of great winter riding to come. All very bear-able.